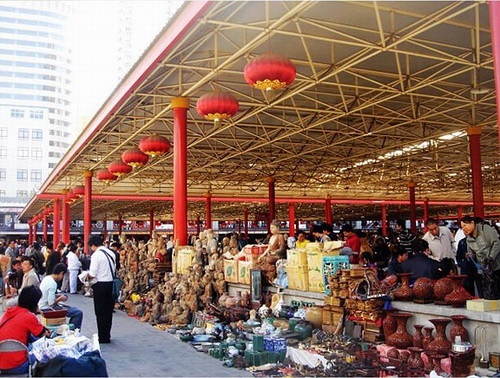 The market is like a big museum, attracting visitors from all over with its unique charm. You will find many types of goods, including exquisite porcelain craftworks, Chinese calligraphy, painting, ancient carved furniture, ancient books, writing brush, ivory carving, traditional propaganda pictures or Chinese musical instruments. In such a large market with various goods, there is chance to find real curio. But be aware, the Chinese purveyors are experts at making fakes look like ancient treasures dug up. Unless you are a dealer in Chinese artifacts and have years of experience, it is almost impossible to tell the difference. Many of the stalls are open through the week, but the flea market is best early on Saturday or Sunday. Subway Line 10, get off at the Jin Song station. Bus Routes 674,36,34,28,802, get off at Panjiayuan stop. Free to enter, suggest bargaining on the products.